After warming up with a daytime menu of sublime subs and antipasti, Torrisi Italian Specialties launches dinner on March 9, and with only eighteen seats and no reservations, it’s bound to be a tough ticket. The set menu will change every few days, cost around $45, and marry sophisticated technique to familiar American ingredients. 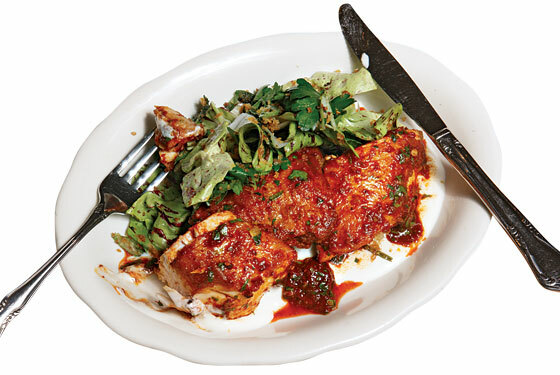 Here’s a preview: smoked-sable crostini with cod roe and everything-bagel spice; hearts of palm with Bazzini peanuts and house-cured anchovies; ravioli Caruso, a chicken-liver pasta possibly invented for the famed tenor; and an entrée (like roasted chicken in devil’s vinaigrette, pictured). Pink-grapefruit Italian ice and cookies for dessert (250 Mulberry St., nr. Prince St.; 212-965-0955).